This is a factual book about a 13 year old girl’s journey from Mohali to St. Petersburg for football! A chance visit to the local branch of Bank of Baroda opened an exciting new world for Ananya. Here’s my book review about it. 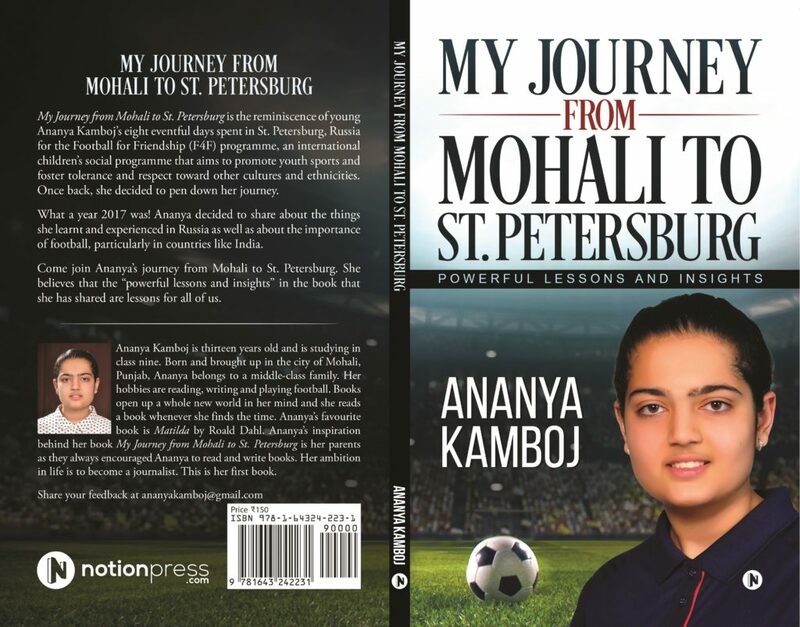 My Journey from Mohali to St. Petersburg is the reminiscence of young Ananya Kamboj’s eight eventful days spent in St. Petersburg Russia for the Football for Friendship program, an international children’s social program that aims to promote youth sports and foster tolerance and respect towards other cultures and ethnicities. She believes that the “powerful lessons and insights” in the book that she shared are lessons for all of us. Ananya Kamboj is 13 years old and is studying in class nine. She is from Mohali Punjab and her hobbies include reading, writing and playing football. This is her first book and her ambition in life is to become a sports journalist. What are the odds of a girl from Mohali’s middle class family, dreaming about making a mark in the field of sports journalism and being selected at an international federation for Football? That’s exactly what Ananya did and succeeded. This is one of the best real life example stories that I have read in the recent past. It does not talk about taking over the world or breaking shackles and stereotypes but it is a really warm recollection of a life changing experience that changed her perceptions about life and world at large. The experience taught her some important life lessons and strengthened her resolve to be a sports journalist. The book talks about how Ananya saw a poster about a ‘Contest for Young Journalists’ encouraging students to report on Gazprom’s Football for Friendship Championship in Russia. The contest was organized by Mission XI Million (MXIM) an initiative spearheaded by FIFA and All India Football Association (AIFA), supported by Govt. of India. Ananya won the contest and went on to be a part of 64 other young journalists from around the world. Noteworthy is that the program is in its 5th year and this was the first time India was being represented at this world platform, that too by a girl! I am not sexist, but when daily news is filled with crime, hatred and objectification of women this was a welcome change that I am sure will inspire many more young adults to create a constructive future. She talks about how Football for Friendship opened doors to the world where she made friends with participants from around the world, understood their culture and ethnicity, fostered fairness, equality and peace among other things. Ananya shares an interesting anecdote where she became friends with a boy from Pakistan. She points that such events and team games help foster Global Relations and even triumphs political tensions. The interesting information, trivia and history of the game that she shares all along in the book is really informative and engaging. She shares the core valuable lessons that F4F tries to spread and inculcate in its participants, her key takeaway, her first real life experiences. It is interesting to read about her experience of being in a studio as a part of Open Draw ceremony where they were planning, writing, shooting, editing and doing much more while getting a real taste of being a sports journalist. Doing this book review was a wonderful experience for me too, because as a parent I realized that children just need that tiny push to be able to shine on their own. I would highly recommend this book to teens who wish to make a mark in a different field and aspire for alternate career path. I would also recommend this book to the parents who realize that a child’s education is not limited to a classroom. The values and lessons that Ananya shares in the book can be used by one and all, hence do check the book out. This is not only inspiring for teens but for anyone really. I would buy copies for my brother, niece and nephew who are at the career choosing stage and can think about choosing their interest as the career and giving their best in it like Ananya. This is just amazing… a true inspiring and motivating story. I want to read about her journey from Mohali to St. Petersburg! It sounds like an Uber inspiring read. I am gonna pick it up soon. I am more into such books and dose of positivity is always welcome. She is an inspiration to everyone- teenagers, girls, parents and any individual actually. I will surely get the book. I normally do not read non fiction but I feel this story is something which my kids can relate too. This sounds a really inspiring read. I love non fiction will surely check this out . Amazing that she hot the opportunity to represent India at such a small age. It’s a motivation to all girls and not just girls all children that their determination and smart work can help them achieve many heights. I have met Ananya’s Father Vikram Kaboj personally and knowing him, it is no surprise that his daughter is as tenacious and inspired as him.He has really worked hard with her and I am really happy to be following the journey of this little star .This is an inspiring book for all girls of Ananya’s age . This seems like a great read , will surely Check at Amazon , what I liked is study and growth is not confined to class room .Kids should get more exposure to outside world. Wow! This made for such an inspiring read. Ananya’s journey is awe-inspiring considering that she is just 13. More power and success to her. This is such an energetic girl, who has not just made her parents but all the fraternity proud. She is an inspiration for many I am sure. Great that your reviewed Ananya’s book and got us on toes to read about her. This is such a triumph for a young girl wanting to venture into sports journalism. How her experience truly enriched her. Fantastic that she wrote a book about it. She is so inspiring at such a young age. Football is a great sport to bring everyone together. This is looking like really an inspiring read, and I am curious to read the whole story. thanks a lot for sharing such a great review. This must’ve been such a lovely book to read. And super inspirational too.